Day 1046 - New Years Eve! 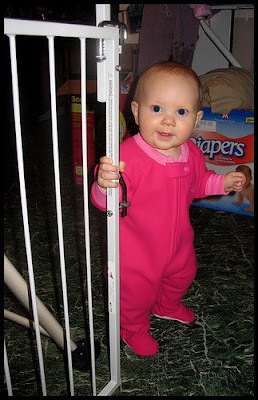 Here's OUR New Years Baby, Savannah - playing peek a boo (which Charlie calls Peep-eye, which is a Southern thing). I was just looking for 'peep-eye' on the web, and people are calling it 'Pee-Pie' for goodness sake. I just don't understand spelling sometimes. Anyway - check out this item for sale which references both pee-pie and peek-a-boo. I've already apologized this morning to Charlie for kissing Brendan Fraser in my dream last night. He had REALLY long hair, and it was baby fine. (I remember more about his hair than anything else- trust me on that). What are you doing for New Years Eve? Any additional New Years Resolutions you want to share? Care to tell us which movie stars YOU have dreamed about lately? 'Dear Bloggy' is waiting for your comments! Happy New Year everyone - Blog at ya next year! Greetings, Bloggy Twofers! It's New Years Eve Eve - that's a Twofer if I ever saw one! I am running late - it is already 6:10 and I haven't written the blog. That means this will be short and sweet! First - we have family (Charlie's side) coming in for the next couple of days, so I am scurrying around making sure we are ready. I changed out a hand towel from the guest bath yesterday, and when I pulled it off the towel hanger, one of my socks fell out! It was inside the towel, and we have been using the towel, and nobody noticed a sock was stuck to the inside! Thankfully I just changed it. Second - while I was pitching stuff in my closet to get rid of it, I found yet ANOTHER bag of gifts (just a few) I had put away and never taken out on Christmas morning! That is the SECOND bag I have found that I didn't take out. Sheesh. Third - I have to go to work! TTFN and have a nice New Years Eve Eve! 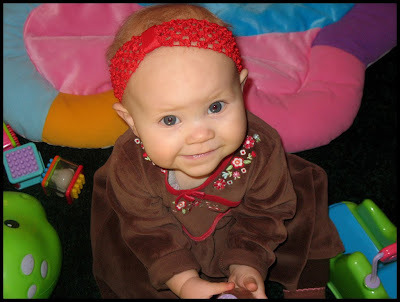 Here's an adorable photo of Miss Savannah on Christmas Eve. She's a lot cuter than MONDAY is. Yesterday I felt like I 'have arrived' at a place where riches flow. I allowed myself to use up extra sheets (aka be wasteful) using one of those peel-and-roll sticky lint roller devices - all just to get the lint off two velvet pillows. They look lovely now. I feel positively sinful using up those lint roller sheets! Now WHY do I care? If I use up the whole darn thing, I can go buy another one! Are you ridiculously cheap about stupid things? I am! New Years Resolution #1: Give myself permission to waste lint roller sheets. I'll go a step further and include dryer sheets too. New Years Resolution #2: Give myself permission to throw away or give away stuff I don't like or don't use. I have stockpiles of STUFF, and I need to give it away or throw it away. New Years Resolution #3: Admit to myself that my eyes are getting OLD and invest in a pair of reading glasses that cost over $1. New Years Resolution #4: Give myself permission to make and break resolutions all year long. ANYTIME is the right time to TRY AGAIN! Day 1043 - No time for bloggage again! As seen on a church sign nearby - 'Exercise more - walk with the Lord'. Pretty good! Hey - are you going to make any New Years Resolutions this year? Do you normally make promises to yourself that you don't keep? Day 1042 - Christmas plus two! Ahhh - one day at work after Christmas, (and they let us out early), then two days off. I could get used to this! Gotta go to water aerobics and work off some of that prime rib and ham. After that, I need to decide if there is anything I REALLY, REALLY need that would make it worth my while to brave the mall and the 'after Christmas' sales. My health club is near the mall, but I have been taking alternate routes so I don't get stuck in mall traffic again. Day 1041 - Merry Christmas Plus One! Are you going out shopping today to hit the after Christmas sales? Come on out of your Christmas food coma! This photo shows the first few slices of my rare prime rib (the bones have been cut off the bottom - they are over in the left corner). It was extremely delicious! We ate all the prime rib we could hold yesterday, with mashed potatoes, au jus, peas n onions, cauliflower with cheese sauce, and rolls. I have a few more meals worth of prime rib packaged up. I cooked it to 110 degrees, then let it sit for an hour before carving it. It was yummy, and you would be horrified to know that this is as done as I would ever want to eat it. I have to work today - TTFN and have a nice day after Christmas! Day 1040 - Merry Christmas! Santa Claus came to our house last night! Here's the picture of our tree - studded with Christmas envelopes, some of which had gift cards in them! Charlie and I are very happy with our Christmas gifts - we like practical gifts best. I got several gift cards, new jelly jars, postage stamps, a stainless steel (no rust!) canning rack that I have wanted for YEARS, a chip and dip serving dish, and more stuff! Charlie got gift cards, new jeans and t-shirts, a new watch that clips to a backpack or belt loop, a magnifying glass, and more stuff! The prime rib is sitting on the counter to get to room temperature before going into the oven. By the way - my ham yesterday came out absolutely delicious. I love spiral hams, but a real, slow roasted, oven baked ham is jucier and better tasting, just more trouble to cook and cut! Have a great Christmas! We'll be home all day and we'll make some phone calls to the 'FAM'. Day 1039 - Merry Christmas Eve! 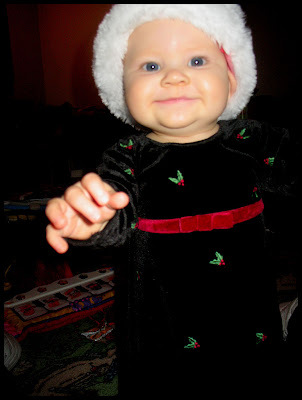 Greetings, Merry Christmas Eve-ers, and our adorable Santa Baby Savannah! Charlie and I just finished a big breakfast of loaded scrambled eggs, bacon, home fries, and wheat toast with apple butter. Now we are off to the health club to work it off. I am cooking a bone-in ham later today, and will take the leftovers off the bone, cut it up, and freeze it into packages. Tomorrow I'll be roasting a 7lb. PRIME RIB! A fresh one, not the precooked heat and eat that I usually get. 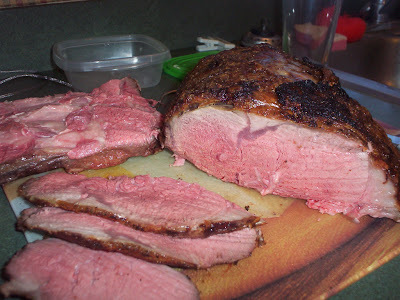 I couldn't resist a local store special of $5.99/lb for standing rib roast (small end, too!). The cheapest I have seen them otherwise is $7.99/lb. I am so happy every time I look in the fridge. I will use Heather's wonderful Christmas present a few years back - a digital roasting thermometer, so I expect it to come out PERFECT. I will certainly let you know! TTFN and have a Merry Christmas Eve and a Merry Christmas Day too! Day 1038 - It's POSTING 1000 day! 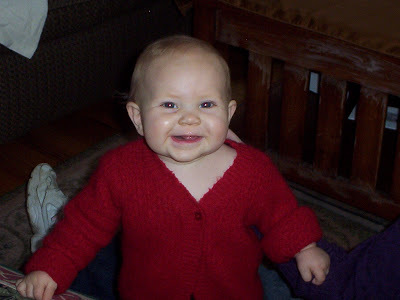 Today is day 1038, but this is my 1000th blog posting. Can you believe my little fingers have bothered to LOG IN 1000 times? ONE THOUSAND... that's a lot, doncha think? Savannah's coming closer for another look. Hi Savannah! This is the cutest picture! I got trapped in mall traffic yesterday trying to go home. I'll be glad when THAT is over, but it won't be until after the 'after Christmas clearance' season has passed. So - where am I in my holiday planning? I still have presents to wrap, I still have groceries to buy, and I'm not quite sure where I hid one of Charlie's stocking stuffers. They scoured the house, and couldn't find the shirt. They finally went online and discovered the shirt was backordered and had never been shipped. They didn't know it had never arrived! Pretty funny. I have done that in the past - forgotten presents I had hidden, or not been able to find them! I always have plenty of presents though, so it never really mattered! 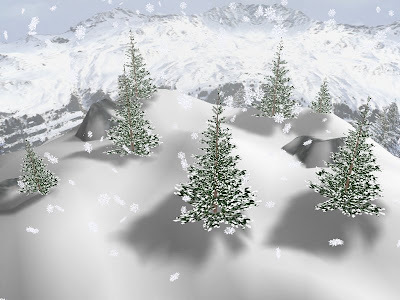 Gotta go, TTFN and don't forget that TOMORROW IS CHRISTMAS EVE!!! Aw, little Savannah is NOT happy in the cold snow! Poor thing! It is BITTER cold here - only in the teens. We never made it to that movie yesterday. Drat! We drove all the way to Opry Mills (over 40 miles), and the newspaper was WRONG - they didn't have the early morning matinee that we like to catch when they schedule them. Anyway - we had a lovely day at home watching football and staying warm. The Tennessee Titans won today, meaning they get home field advantage for the playoffs. Nice, work, Titans! Are you ready for Christmas yet??? It's almost time! TTFN and GET READY - Santa is on his way! No time for bloggage - Charlie and I are going out the door to hit the health club, then go see the remake of 'The Day the Earth Stood Still' at the Opry Mills mall. Side note - I went to 'Trader Joe's' yesterday - kind of a healthy-food, lower cost grocery store. It was awesome - they have low fat spanakopita (spinach pie with fillo dough crust) for $3.99 for a 24 oz package! I am in heaven. 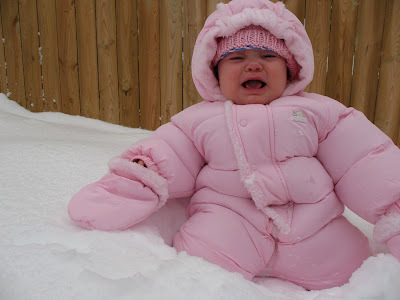 Just look at this adorable snowsuit - somewhere inside there is little Miss Savannah! I love it! 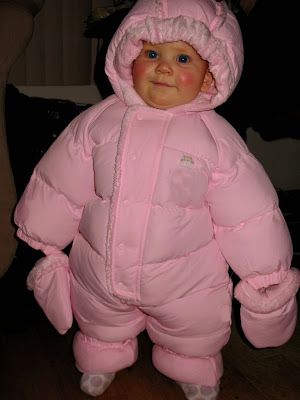 She looks like a cute little pink balloon! Love it, love it, love it. I laughed outloud and couldn't wait to put it on the blog. Are you ready for Christmas yet??? I'm missing water aerobics because I have a cold and need to keep tissues handy - tissues in the pool won't survive! Ha! Gonna go do some last minute shoppage in between blowing my nose and watching my eyes turn pink. Day 1034 - Friday! Hooray! It's the morning after the company Christmas party, so there may be a bunch of tired folks at work today. I had a nice time! I have been filling in Charlie with the details from the party. Several people on our team did go, and I snagged a table next to the dance floor and away from the food tables. I did dance a couple of times. Food - meatballs in BBQ sauce, mini sandwiches, crab or sausage stuffed mushrooms, artichoke dip over tortilla chips, veggie trays with dips, and roasted pork loin with rolls to put it in. Very good. They kept a running slideshow going of photos of employees from previous events (Christmas and Halloween). They gave away 30 prizes, one of which I won! If they called your name, you had to walk to the stage and choose a Christmas ball from the Christmas tree. Each ball had a number taped to it, and that was how they awarded your prize. I can't tell you what it is yet, because I am giving some of it to Charlie for an extra Christmas gift! Two other employees approached me and offered to trade. I could have taken a pair of hockey tickets to the Predators, or a nights stay at a hotel with dinner. The hotel stay was hard to pass on. They had a deejay playing music, and open bar for beer and wine (if you had purchased a bracelet for $10 prior to the event). Well worth going. You know, going wassailing is going out caroling, as opposed to a Christmas Wassail drink, which is hot spiced cider or wine. We have a company Christmas function after work tonight. I am catching a cold, so I hope I can stand it for a little while (that means partake of the food and drinks, then bail out). A lot of my team isn't going - they say it's because spouses aren't invited. Charlie doesn't take exception to a company paid activity being just for employees. After all - did spouses want to come to our summer picnic and do water balloon tosses and relay races? HECK NO! Have a great Thursday! Christmas morning is one week away! 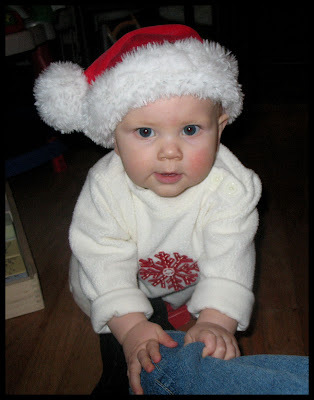 Here's Savi Santa, bringing good cheer to all. It really looks cute when she is reaching for the camera. I love that dress. Heather - I also love the walking video! Awesome! Our team had a Christmas Potluck luncheon yesterday at work - I brought a crock pot full of Hawaiian (teriyaki/pineapple) meatballs (Sams Club) and everyone enjoyed them. My manager said 'You always bring the best food, you must be a great cook!'. Here is a link if you want to read about them. We had a 'Dirty Santa' gift exchange also - where you can choose a wrapped gift someone brings in, or steal someone's gift that has already been opened. That was fun, and I ended up with a Dockers shoulder bag (kind of an overnight bag) with a matching hanging toiletry kit. Anyone that knows me knows I like to travel with a hanging toiletry kit. Now I have a large one for big trips and a small one for small trips. Day 1031 - Do you h-EAR what I h-EAR? 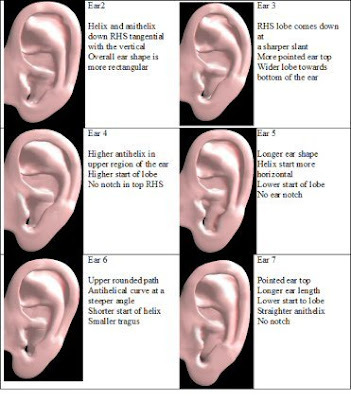 Todays photo depicts different types of ears. Because I bought an annual supply (aka 500 pack) of cotton swabs (aka generic brand of Q-tips) recently, and the darn things DON'T FIT IN MY EARS! Don't they test market these things? How am I supposed to use them to clean inside my ears if they don't fit? Do they need to come out with SIZES for Cotton swabs? It is NOT one size fits all, folks. I take a size 8, please. No, not the tall one, the short. I have an inner ear inseam of only 3cm. NO! Not the ones with wings! Yes, the designer ones. Can I try them on? Do you have a mirror? Thanks! If they don't even fit in my ears, how would they be useful if you have children or babies in the house? All this ranting and raving over an item that cost a couple of dollars. I just need to think of some creative use for them, and go buy another box. I hope I can make it through the work day, half deaf from waxy buildup. Just kidding. Day 1030 - Oh No - Monday again! Miss Savannah's expression says 'Don't whine at ME about Monday, I'm not listening to YOU'. On MSN this morning I read a little feature about lame excuses people give for not coming to work. My favorite was the person who said they weren't coming in to work because they were tired and needed to rest up for the company party that evening! Hilarious. Gotta go look on the web for the present I couldn't find yesterday. TTFN! We've had a nice morning having breakfast out with our friends visiting from Houston. Charlie is leaving soon for a duck hunt, and I am going to try to wrap up my Christmas shopping. Have a great Sunday and TTFN! Day 1028 - Snow is still here! 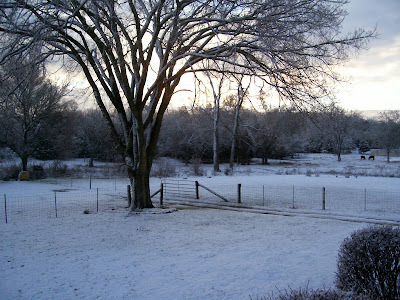 This lovely snow photo of our yard was taken yesterday by one of our blog photographers - Charlie. It was 20 degrees overnight, so the snow is still there! Today it is supposed to go up to 50 degrees, so we'll kiss the snow goodbye. I want to tackle some 'decluttering' around the house today, so I'd better go. Day 1027 - Our first snow! First - apologies that I didn't say 'Happy Birthday' to my brother David yesterday. I did send a card but should have mentioned it on the blog! It snowed last night, and it's Friday! The schools are closed today. I think we got 1-2 inches, but I haven't been outside in it yet. Maybe the 4-wheel drive in my Honda CR-V 4 door color white will kick in today for the first time. The 4-wheel drive activation is supposed to happen automatically based on the road conditions. I guess we'll see about that! Nashville hardly got any snow - it was mostly concentrated to the south and east of Nashville. Anyway - I'd better leave early for work - enjoy your Friday, everyone! Day 1026 - Miss Savannah Steps Out! 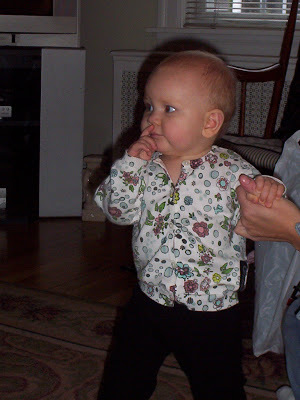 This photo shows Savannah contemplating something - probably what it would be like to let go and walk across the room. By the way, I love the shadow effect on this picture - no, I didn't do it intentionally, it just came out that way. 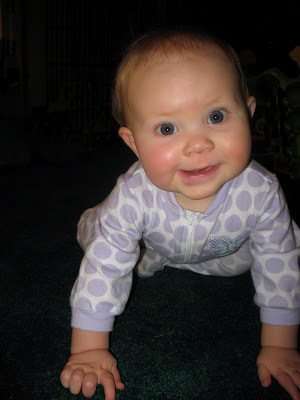 If you didn't read the comments yesterday, little Miss Savannah (who just turned 9 months) took her first unassisted steps yesterday! Go, Savi, Go! Ah well - the fun has just begun! TTFN and Congratulations again to Little Miss Savi-walker! Here is Miss Savannah, glowing with happiness, as usual. Me, on the other hand, am glowering vs. glowing. Charlie said 'That's the second alarm.' He didn't move. I said 'I'm deaf. I can't hear it.' I didn't move. Eventually we got up. It feels like today should be Friday, but it's NOT! There are days and days left till the weekend. Sigh. Okay - so much for my 'gripe and moan' session this morning. 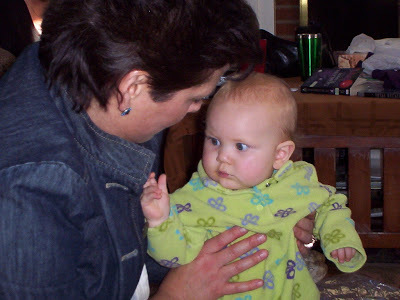 Dr. Bloggy, why am I griping and moaning? Karen, your feelings are normal. You may experience an increased level of stress from working during the holiday season when you want to be sitting in front of the Christmas tree with a cup of Egg Nog and Nat King Cole singing Christmas Carols in the background. That will be $150, please pay the receptionist on your way out. That's my grand-girl! Wide eyed and wondering if she'd get away with grabbing it. That expression is priceless! Too cute! I didn't sleep very well last night. I can feel it this morning. I woke up at 2am because I remembered (7 hours later) that I'd left a couple items in one of those silver 'freezer keeper' bags in my car after stopping at the store! What a dumbo, and why did I remember THEN? So up I went, put on shoes, went out to the car, put away those couple of items, and went back to bed. When I finally got back to sleep, I had this crazy dream of renting a multi-level suite (a really fancy one), and having some people (two couples!) sneak in and stay on the lower floor that we weren't using. I couldn't get them to leave, so I stole their car remote for vengeance and figured that would cost them a couple hundred bucks to replace. 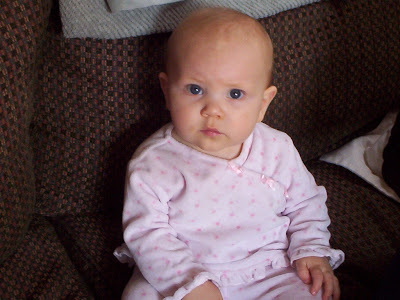 First - I didn't get a chance yesterday to say 'Happy 9 months old!' to Savannah. The time has gone by so fast! Second - meet our new Christmas tree! I had to work a lot yesterday, and whenever I had a chance, I would also 'work' on the tree and setting out Christmas decorations. 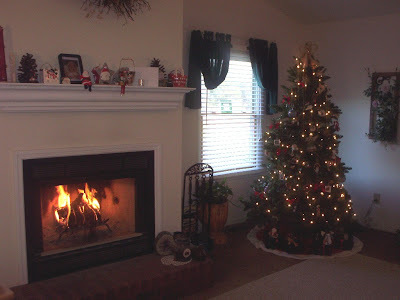 (Check out the mantlepiece for example). For the first time, I have an artificial tree - and I am LOVING IT. This tree was given to us FREE by a lady at my work because I mentioned in a meeting I'd like to find someone who wants to get rid of one. She had recently purchased another Christmas tree, because the lights on this one don't work! (of course, I have lights of my own, since we always had a fresh tree). 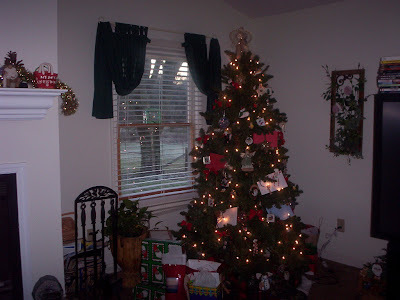 This is a 7 foot artificial pine tree, it was effortless to put up, no search for 'just the right tree', no cutting, no trucking, no fighting with the tree stand, no watering, no balancing, no muss, no fuss. This was the lowest stress tree decorating I have ever had! Thank heavens for that! No, it doesn't smell like a fresh tree, but Charlie could cut me some pine boughs if I am dying for the fresh pine tree smell. I've managed to get in a swim this morning, but I've had some work issues and have been working off and on. A little yesterday afternoon, a little yesterday evening, and a good 4 hours or more so far today. Sorry - no time for 'da blog' so far today - I have gone to water aerobics, shopped, and am doing laundry at the moment. You know what to do - march in a circle chanting 'Fri-day! Fri-day! Fri-day!' You know you mean it! Here is another cute photo from Thanksgiving week. 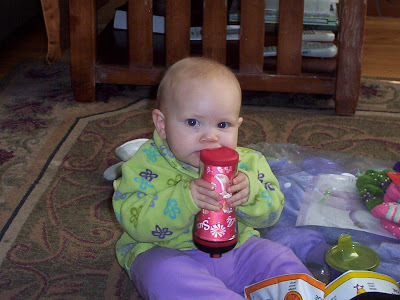 The festive cup she is chewing on was a present from Cheryl. Uh... Savannah - the other end of the cup is the one most normally used! Just a quick story from the mall yesterday - I went at lunchtime to do a little Christmas shoppage. You know the 'vultures' (both male and female) that stand at sales kiosks and accost people with perfume or health products or whatever? They annoy me because they invade my personal space and try to sell me something I'm not interested in. I avoided one of them who approached me with perfume. I looked him in the eye and said 'ALLERGIC'. He pulled away from me like I'd hit him with pepper spray. I was happy. Another woman said 'Good afternoon, mademoiselle'. The use of 'mademoiselle' made me smile. That was a deadly mistake. She took that opportunity to stalk me and say 'Are those your natural nails?' and try to lead me over to her kiosk. I said 'I have to get back to work', and walked on. 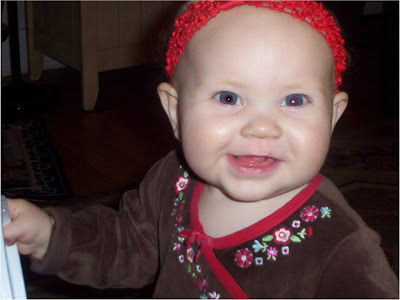 Here is another cute photo of Miss Savi from Thanksgiving week. Changing subjects - I had a creepy dream last night, kind of a kidnapping sort of dream. Wherever I was (some sort of cabin I think) was invaded by two people. A big, bald headed man (no tattoos) with very pale skin was the leader. He was a bit scary. He didn't want to kill me, he wanted to use my Blackberry to send evil text messages. (who would dream THAT?) I was going to let him, but was trying to devise a way for my name NOT to be on the messages. While trying to think up a plan, someone (unknown - neighbor maybe?) came to the door with a shotgun and marched them out of there. I was thankful my blackberry didn't go with them. Now what on earth does that mean in dream symbolism? TTFN and have a nice, safe Thursday! Charlie set out his towel this morning and got in the shower. The towel was a medium green color with embroidered frogs on a strip at the end. I had already showered, and decided to change them out for fresh ones. I scooped up his towel and my wet towel for the wash. I replaced his towel with a solid color forest green one. When Charlie surfaced from the shower, I walked in and he was using the new towel to dry off. I asked 'Notice anything different'? He surveyed me critically and said 'I don't have my glasses on'. I said 'You are using a different towel than the one you put down there before - you didn't notice that?' He really studied it and I 'helped' him recall which towel was there before. His defense 'They were green'. Here is Miss Savannah in one of her little Thanksgiving outfits. Cute! Doesn't she look like an elf in this picture? An adorable little elf! I sent a few photos around at work. One of my coworkers said she should quit her day job and become Savannahs agent. Ha! I forgot to mention that the other night Charlie talked in his sleep. He said only one sentence, which was 'I can't keep my mouth shut'. It was funny at the time! I stopped at the mall after work yesterday afternoon. I hit the ladies room soon after. I passed three kids with their mother, exiting the ladies room. Evidently the two older kids were teasing the younger one. He stomped out with a mad face and his arms crossed saying over and over again 'NO MONSTERS', 'NO MONSTERS', 'NO MONSTERS'. I guess they had told him the potty monster was gonna get him, and he wasn't buying it. 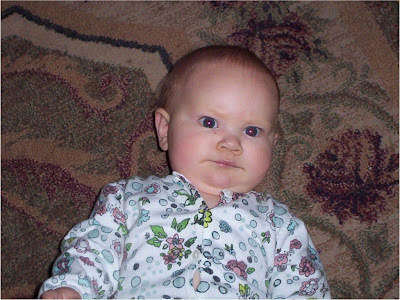 By the way - when I was a kid, I would hold my breath and run upstairs till I could turn on the light. For some reason, holding my breath was the protection. Useless, but it worked for me! Day 1016 - Happy December! Savannah is saying 'Shush - stop complaining about Mondays already'. Isn't this a cute hat? 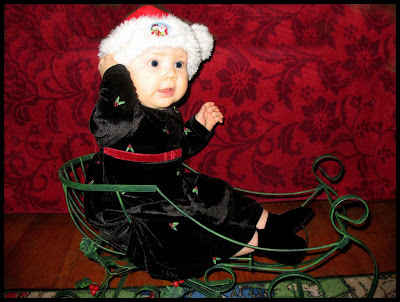 My mother bought the hat at the church bazaar and Savannah was trying it on- Heather would never deliberately dress her in a pink hat and a red sweater. One quick story, then off to work. We might get some snow today. My Honda CRV 4 door color white may kick into four wheel drive! Whoo Hoo! When I was at the movies the other day, I noticed a family who was exiting their movie. The first thing they did was head to the restrooms as a group. He wanted to go with Dad, where evidently the process was faster! Ha! Have a nice Monday and Happy December!